History: 55 year old male with right upper quadrant pain. 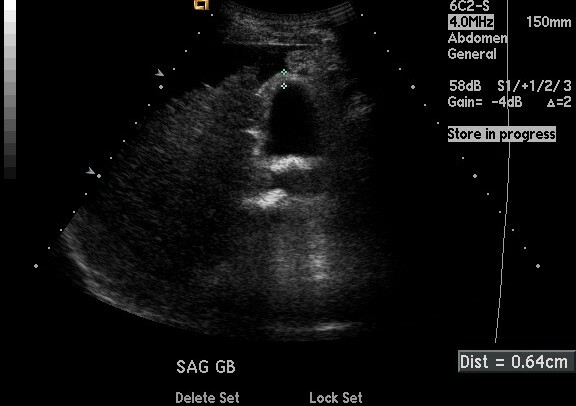 Gallbladder wall thickening: Ultrasound image of the right upper quadrant of the abdomen reveals a thickened gallbladder wall measuring over 6 mm in thickness. Free fluid is also seen surrounding the liver. The normal gallbladder wall should measure 3 mm or less on ultrasound imaging. The differential diagnosis for diffuse gallbladder wall thickening includes cholecystitis, hepatitis, volume overload states such as heart failure, liver failure, and renal failure, hypoproteinemia, portal hypertension, and more rare causes such as gallbladder carcinoma, AIDS cholangiopathy, cholangitis, hyperplastic cholecystosis, adenomyomatosis, and porcelain gallbladder.